Bass guitarists can really mix it up with funk shuffle grooves. Funk shuffle (also called shuffle funk) is a hybrid groove style, which means that it combines several elements of other styles — funk, blues, and jazz. When funk, which normally uses straight sixteenth notes, is combined with blues and jazz, which use triplets, the resulting combination is a lopsided sixteenth-note groove (a combination of long and short notes) — a very cool combination. This type of groove is pretty challenging to play, but some useful tricks of the trade can help make it a lot easier. This groove uses only the root (in two octaves) with an added dead note (a note that sounds like a thud). The drums are crucial in this style because they drive the rhythm along in tandem with the bass. You can start this groove with your index or middle finger on the low root (the starting note). This funk shuffle groove uses notes common to both the Mixolydian (dominant) and Dorian (minor) modes. Whoa! This groove fits over both dominant and minor? Yep! In fact, it’s an ambiguous groove. 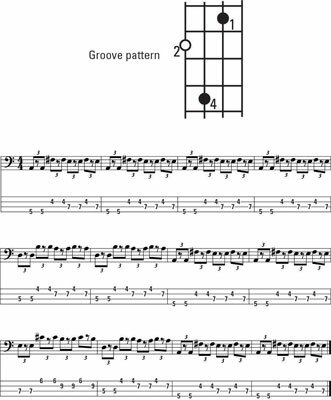 This groove isn’t all that easy to master, but after you get comfortable with it, you can get lots (and lots) of use out of playing it over any dominant or minor chord. In the funk shuffle style, almost all chords are dominant or minor. This funk shuffle includes more notes from both the Mixolydian and Dorian modes; notice the cool syncopation — the way a note anticipates the beat that it’s normally expected to land on. The groove can be used over most chords in shuffle funk tunes (that’s right; it’s an ambiguous groove). Most of the chords are either dominant (Mixolydian) or minor (Dorian). Start the groove with your index or middle finger to keep it in the box (so you don’t have to shift your left hand). As you listen to the funk shuffle grooves, your head should be boppin’ with the beat. The funk shuffle has a much more…well…funky sound than the other shuffle styles. You still have the lopsided shuffle feel but with a lot more attitude. You can also watch this funk shuffle groove. The quintessential generic shuffle/swing song is a good old-fashioned blues.